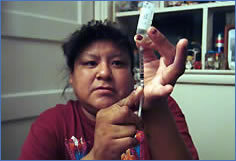 The Pima and Tohono O’odham Indians of southern Arizona have arguably the highest diabetes rates in the world – half of all adults are afflicted. But a century ago, diabetes was virtually unknown here. Researchers have poked and prodded the Pima for decades in search of a biological – or more recently, genetic – explanation for their high rates of disease. Meanwhile, medical-only interventions have failed to stem the rising tide not just among Native Americans, but globally. What happened to the health of the Pima? During the 20th century, the diversion of river water to upstream white settlements disrupted the Pima’s agricultural economy and customary ways. Local tribes were plunged into poverty and became dependent on the U.S. government. Healthy traditional foods like tepary beans, cholla buds, and wild game were replaced by surplus commodities like white flour, lard, processed cheese and canned foods – a diabetic’s nightmare. A sense of “futurelessness” took hold, and so did diabetes. According to Dr. Don Warne, a trained physician and traditional Lakota healer who works with the Pima, health problems like diabetes begin long before people get to the clinic or the hospital. While obesity and diet are risk factors, so is poverty. People in the lowest income brackets are at least twice as likely to become diabetic as those in the highest. For the O’odham and other Native Americans, the stress of living in poverty is compounded by a history of cultural, economic and physical loss, which researchers believe magnifies its impact on health. Attorney Rod Lewis has spent the last several decades fighting to restore his tribe’s water rights. In 2004 he helped negotiate the largest water settlement in Arizona history, which not only guaranteed the return of water but provided crucial funds to build roads, dams and other infrastructure. Now the Pima are beginning to farm again. Leaders are cautiously optimistic that community empowerment, along with sustainable and culturally appropriate development can help restore prosperity, hope, and health.